Using tons of stock footage, not only from TRADER HORN but also the first two films in the series (for example the alligator fight was used last time out) this is one of the weakest films in the MGM series. Its a huge let down after the classic Tarzan and His Mate which is possibly the best film in the series. The plot has Jane's cousins coming into the jungle to tell her that she has inherited a fortune if she'll come back to claim it. They are kind of in the bind since the relative that left her the money cut them out of the will.Hiring a great white hunter, who secretly wishes to capture Tarzan and sell him, the pair heads into the jungle where they run into the usual jungle troubles (more so because of the stock footage). After lots of talk Jane decides to go back to civilization and we get long sequences of Tarzan and Jame making kissy face. Finally into the last half hour the plot to capture Tarzan is put in motion and things at last become interesting as plans go awry and things look very grim for all concerned.. Painfully dull film is clear evidence of a troubled production. the film seems to have been assembled from several different films with the first half hour playing as an almost exact repeats of the previous film. The middle third shows signs of having to stretch things out and having plot lines that ultimately went nowhere. The last third where Tarzan is captured and the party is put into peril is the point that the film finally comes to life (it also shows signs of the graphic violence that caused much of the need to re-shoot the film). 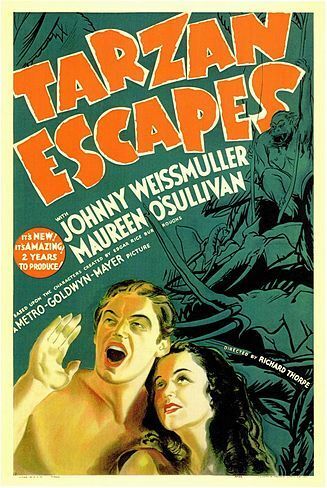 To me its a great wonder how the series managed to continue on from here since this film isn't very good (except at the end).I would be hard pressed to explain it except I would have to say that it was the relationship between Weissmuller and O'Sullivan as Tarzan and Jane which kept people coming back. Its a beautifully acted pairing and really is one of the screens great couples. I should probably also mention that this is the point that the film became less real and more fantastical with the appearance of the Tarzan tree house. I really dislike the first hour or so of this film a great deal and find it a great waste of time and energy. If you can come in towards the end I would recommend giving the film a try. Otherwise I would just skip the whole film and move on to the next film in the series.